Today I will be discussing the battle report in the latest White Dwarf where we saw the Flesh Eater Court go against the newest edition to Age of Sigmar, the Kharadron Overlords. When I first found out about this battle, I was fearful for the Flesh Eaters, as their weakness must be a dominant shooting army, which the Kharadron Overlords look exactly that. Now obviously I do not know exactly how powerful they are yet, however look out on this blog for a review of their battletome which I'm sure will come soon. Firstly, both players have said that they are taking pretty much at least 1 of every option. Here are pictures of both forces. The Kharadon Overlords player have confirmed in his lineup, that the ships are capable of transporting troops with the Skyfarer rule, as the majority of his army were on board at deployment. His general was the Arkanaut Admiral Banebellow. The Flesh Eater player stated that his tactics going into the battle was to get close to the Overlords as quickly as possible, using cover where possible to block line of sight. Also to keep the army fairly compact to take advantage of the possible buffs the generals provide. His general was an Abhorrent Ghoul King on a Zombie Dragon. The first thing mentioned, was the ships of the Overlords opened fire on the Flesh Eater Flayers, killing all but their leader. This was short lived however as the Flayers were able to knit up their wounds, enabling them to stand back up. The flayers then charged the Frigate, bringing it down, killing most of the models on board. The Terrorgheist used its screech shooting attack, killing half of a squad of scouts. More shooting was aimed at the Ghoul King on the Zombie Dragon doing little damage. The Ghouls took more casualties as they charged the survivors of the Frigate crash, leaving only a Mizzenmaster alive, who was then able to enact revenge for his fallen brothers by killing all the nearby Ghouls. More Ghouls attempted to charge the remaining ships with little success as the ships defences proved too powerful. The target for the Overlords at this point became the Terrorgheist as it was teamed up by numerous overlord leaders and generals in a combination of shooting and close combat attacks and the Terrorgheist was brought down by a final blow from the Arkanaut Admiral. At this stage, it seemed the Kharadron Overlords started to gain momentum as a result of their superior firepower, killing multiple Ghouls, Horrors and Flayers, and even keeping the ever increasing reinforcements at bay. Also, the Endrinmaster was able to quickly dismiss the Varghulf Courtier with ease, dealing 9 damage in a single combat round. Next, the remaining ships focussed their attention to the Ghoul King on the Zombie Dragon, inflicting a large amount of damage, however, unable to bring it completely down. The shear numbers of the Ghouls started to wear down the Kharadron as they were steadily taking down their powerful leaders. This freed up the remaining court to target the mighty Ironclad which resulted in a victory for the Flesh Eaters as they were able to bring it down, killing all that were on board. 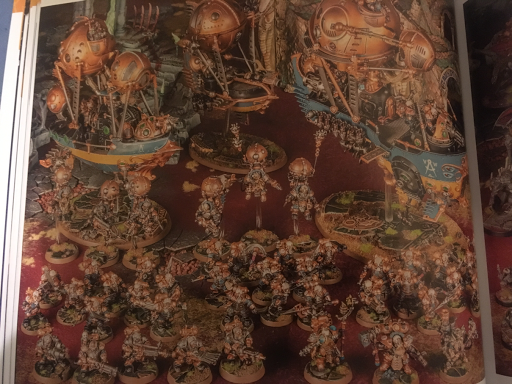 Once the dust of the battle had settled, the Kharadron player stated he was pleased with how he played and he is unsure how he could have approached it any differently. He did mention that he seamed to be very unlucky with the dice rolls. A statement which was backed up by the Flesh Eater player. The Flesh Eater player said he believes that the fact most of the Kharadron were on their ships and unable to do anything worked in his favour, as they were not able to use their full firepower (Units on board a ship are not able to do anything until they disembark). Lastly, he stated that it may have been better to spread his army out a bit, which would have limited the targets for the ships, but overall he was happy how the Flesh Eaters performed. My thoughts on this battle is that the Kharadron need to keep their distance as much as they can. By doing this, they can take advantage of their firepower and the fact that they are not very powerful in close combat, apart from the odd leader. 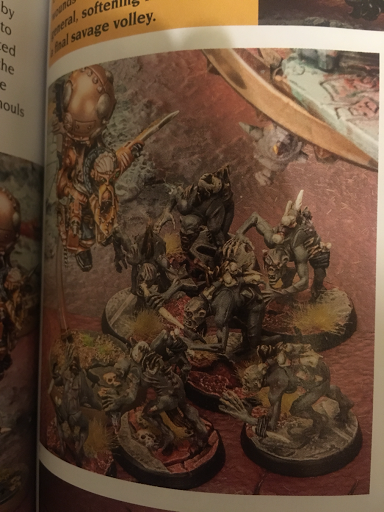 This I'm sure will be covered in more detail when a review is done on their Battletome. As for the Flesh Eaters, I feel they really do rely on their summoning. This could make them difficult to be competitive in matched play as a result of the limits to summoning. 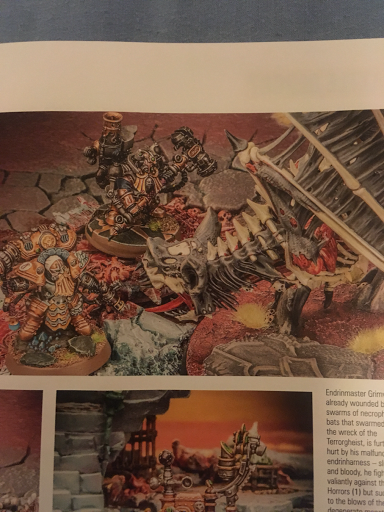 As a Flesh Eater player myself, I am very pleased however that they were able to beat the "new guys on the block" :-). 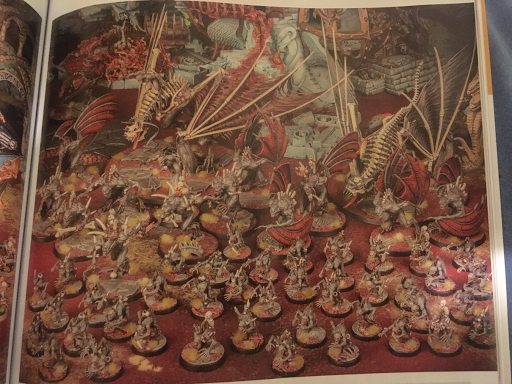 I recommend going out and getting a copy of this months White Darwf to check out the battle report in more detail yourself and see more of the amazing photos they have in there. That's all from me, please stay tuned for future content on our blog. Get involved by telling us what you think or any questions you have in the comments below. I felt that there was a good chance the Flesh Eaters got a double turn on the turn 1 - 2 flip - the crypt flayers suffered one turn of shooting and were then able to get into the frigate without suffering any shooting. Possible, but if you look at the deployment drops it is 4 (3 airships + Arkanaut Company) versus 8 (Kings Ghouls + TG + Crypt Flayers + Crypt Horrors + Ghoul King + Ghoul King + Varghulf + 2 Courtiers) which would give the Kharadron player choice of who goes first. The way the report is written it is pretty clear that the Kharadron player starts the game which fits with the Flesh Eater double turn and the way the Flayers were able to get in untouched. Agreed on not playing very well, although in fairness both players mention how incredibly poorly he rolled.I could see starting on board the skyships in an objective based game as it would make the foot sloggers a lot quicker, but I think in the kind of game being played I agree with you.